Whether you’ve got an exciting vacation trip coming up or you’re still at the planning stages, there are plenty of apps out there to help you figure out what to do, when and even how to budget for everything. How do you figure out what apps are worth your time, though? Never fear for if we’re here with a selection of cheap apps that make planning and tracking a trip fun rather than hassle. There’s seemingly a Google app for everything and Google Trips is an ideal tool for those trying to organize a vacation. The app automatically gathers your travel reservations from Gmail, allowing you to see your flight, hotel, restaurant bookings, and rental car plans all in one place. Day plans are provided for the area you’re visiting, along with nearly attractions and suggestions. Guides by Lonely Planet offers a selection of city guides for many popular destinations. It comes with offline maps, phrasebooks, and advice on the best activities to pursue while visiting. With many years of experience via the Lonely Planet website and books, it’s an ideal compendium. Carefully curated, there’s lots to learn here. TripIt organizes all your travel plans in one place. By emailing it your confirmation emails, it designs an itinerary meaning you’ll always be on top of everything. Its true benefit shines through for frequent flyers, ensuring they always know what they’re meant to be doing and when. You can easily share plans with others too. Sygic Travel offers itinerary planning like other apps, but it also provides you with some advice. It’ll show you where tourist attractions are located, providing navigation even when you’re offline. In each case, opening hours are provided, along with time and distance estimates so you know exactly how long everything will take. Weather forecasts back things up. Roadtrippers is great for those traveling cross country via car. It offers an easy way to plan your road trip, along with information on millions of places along the way. It’ll give you insight into great local diners, unusual roadside attractions, national parks, and hotels to stay at along the way. Tying into the Roadtrippers website, it’s ideal for using across multiple devices too. Packing is a boring but essential part of traveling. PackPoint hopes to take out some of the effort. The app tells you what you need to pack based on how long you’re traveling, the weather at your destination, and what kind of activities you plan on partaking in while you’re there. You can adjust it according to if laundry facilities are available, as well as if you’re willing to repeat wearing certain items. 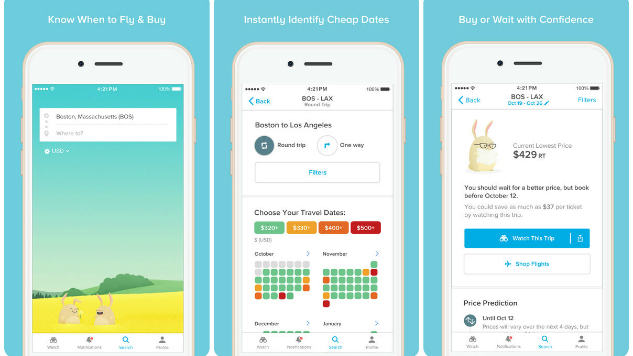 Hopper predicts the future price of flights and tells you when’s best to buy your chosen destination. It’ll save you the hassle of checking manually all the time, offering push notifications the moment that prices drop. It’s possible to buy a flight in a matter of seconds. There’s room for personalized deals and sales too, along with travel tips. Skyscanner offers an easy way to search for flights, hotels, and car rentals. It works in a similar way to Hopper, sending you notifications of when there’s a price drop, but you can also use it to compare future flights and deals. You can even use it to search ‘everywhere’ making it perfect for a random last minute vacation. TripHobo helps you create personal travel plans that suit your needs, interests, and budget. More interestingly, it’s possible to view other people’s itineraries and gain inspiration, or simply follow their route too. Alongside that is crucial information on destinations, such as public transportation details, prices and maps, and you can also book hotels through the app. Don’t want to fly, and don’t want to stay in a hotel? Head to a RV park! RV Parks & Campgrounds offers information on over 40,000 RV parks, campgrounds, rest areas, and gas stations. Commercial RV parks are sorted by ratings so you can see where’s best to visit. There’s information on national parks too.